Another bumper field was on hand for the NSW Production Touring Car Championship, as we entered Round 6 at Sydney Motorsport Park – the second enduro of the season, and the fifth and final round in the CAMS NSW Championship portion of the season. Coming into this event, just six points separated the top three, with Matthew Holt (364) leading Blake Aubin (361) and Chris Reeves (358). Reeves, the defending two-time champion wasn’t about to concede defeat, but admitted that winning a third consecutive title this weekend was a long-shot. Blake Aubin, the debutant from Bathurst, has had a stellar season, winning Class C in three of the opening four rounds, constantly fighting with Jimmy Vernon for track position in those races, and exceeding his own personal expectations along the way, to be in the fight for the title, and odds-on to win Class C in 2016. Then there’s Matthew Holt – a sentimental favourite within the paddock – in the Class A2 Holden Commodore V8, looking to break the dominance of Chris Reeves, who has won the last two championships. Holt has done everything so far in 2016, having finished all the races thus far, and comes into the finale with a 3-point lead. He’ll team-up with Josh Muggleton this weekend, in a bid to get the job done. Another huge field was on hand for the final NSW round of the 2016 Championship – a round that saw the return of both Gerry Murphy and Brett Heeley, Aaron Hills making his debut alongside his son, Finley, and Jacob Andrews was back on the grid too – he would team up with Dylan Thomas in a CXC Global Racing Mitsubishi Evo IX – his first outing since a massive shunt during practice for the July round at this venue. Also back on the grid was Luke Searle – fresh off three rounds of running in the Australian Production Car Series with Paul Morris – in the BMW M135i, and teaming-up with Barry Graham as per normal. Stacks of co-drivers entered in this event, including Cath Loiacono, who’s teaming up with her husband Paul, in what will be her first Production Touring start. Jacques Oosthuizen was forced to withdraw his #96 CXC Global Racing Evo from the field on Friday afternoon, due to ongoing mechanical issues with that car throughout Friday Practice, but it wasn’t the end of his weekend, as he simply moved across the garage, to team-up with his brother, Daniel for the remainder of the weekend. Conditions were dry, fine and sunny on Saturday for qualifying and again, the Mitsubishi brigade took centre stage. In Driver A Qualifying, Daniel Oosthuizen was comfortably fastest in the 15-minute session, ahead of Luke Searle, Michael Caine, Matthew Holt (fastest Class A2 qualifier) and Rodney Thorpe. Dylan Thomas was still trying to find the right setup for his Evo 9, and qualified in 7th position. Anthony Soole was the fastest B2 competitor in sixth position. Kyle Aubin was fastest in Class C, after Blake missed the session due to a licencing issue that was sorted in time for him to qualify in the Driver B session. For the first time in four rounds, Chris Reeves got the better of Jimmy Vernon in Class D, as he looked to maximise his chance of winning a third title, and not losing a point to his rivals in qualifying was a good way to start. Graeme Cox was fastest in Class E in his Nissan Pulsar, while James Herrington was the best of Class S.
Then, the co-drivers had their chance to set a time, and again, it was the Oosthuizen Motorsport Evo on top of the time sheets – this time with Jacques at the wheel. Josh Muggleton again showcased how easily he can adapt to different cars, by taking the commodore he’s sharing with Matthew Holt to second position. The margin between first and second was only 0.1740, and they were the fastest A1 and A2 cars respectively. Barry Graham was next best, and then Wakefield 300 winner, Adam Burgess – the fastest in Class B2 – in Anthony Soole’s BMW. Blake Aubin was the best of Class C – which came as no surprise to anybody given his superb form right throughout the championship. The entry of Graeme and Josh Heath was fastest in Class D, James O’Donnell topped Class B1 and Geoff Fear was the best placed class E entry. Following on from qualifying, two 6-lap sprint races awaited in the afternoon session – one each for driver A and B. In Race 1, Pollicina Motorsport came to the fore – just as they did in Goulburn, where they won both sprint races and the one-hour on the Sunday. Daniel Oosthuizen held the lead from the start until the fourth lap, when Michael Caine overtook him, moving into the lead, and taking Luke Searle with him, as Oosthuizen was relegated to third. Dylan Thomas moved to fourth, ahead of Matthew Holt and Rodney Thorpe, who were first and second, in Class A2, respectively. Anthony Soole stuck it to those Class A2 Commodores, taking his Class B2 BMW to sixth (first in class). Paul Loiacono took 13th, and in the process, claimed victory in Class B1, ahead of the GWS Motorsport entry of Peter O’Donnell. Jimmy Vernon (D) and Blake Aubin (C) won their respective classes again, running 17th and 18th outright, while Graeme Cox was first home in Class E, down in 27th, and just behind them was Class S winner, James Herrington. Race 2 – for B drivers – was a very entertaining 6-lap affair, which saw Josh Muggleton take it to Jacques Oosthuizen from first until last. For six laps of the 3.905km circuit, they were separated by just car lengths, with Muggleton doing all he could, to try and find a way past, but to no avail, as Jacques Oosthuizen claimed his first ever win in the V8 Superlaps Production Touring Car Championship. Muggleton claimed A2 honours with second position, ahead of Jim Pollicina (A1), Scott Bargwanna (A2) and Barry Graham (A1), who rounded out the top five. Adam Burgess continued his impressive run, with 6th position (1st in B2), while Graeme Heath was first in Class D, just ahead of the best placed Class B1 entry of James O’Donnell. The BMW130i of Nicholas Cox claimed Class C, with Geoff Fear winning Class E and James Herrington again taking Class S.
That was the last time the drivers would take to the circuit prior to the main race on Sunday afternoon, which was the last event of the program – and from Day 1, the Oosthuizen combination looked strong, and Jacques will no doubt have some new found confidence, after grabbing his maiden win, while everything went to plan for Holt, Reeves and Blake Aubin, but still, it was Matthew Holt’s championship to lose – he took a 9-point lead into the deciding race of the State Championship, and that combination, of Holt and Muggleton, looked really strong, after a very good showing in the sprint races. 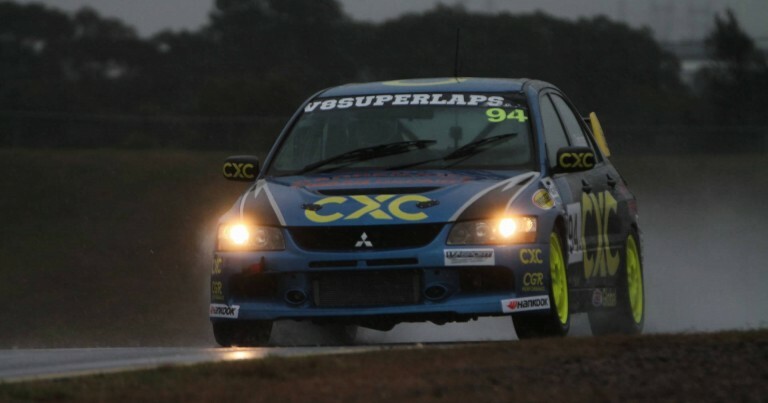 Sunday dawned cloudy, and eventually the rain arrived at Sydney Motorsport Park, and never left – the final race of the CAMS State Championship would be a wet affair. 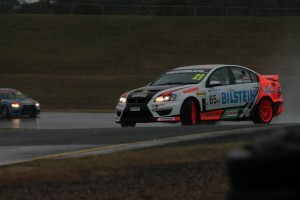 Unlike the Wakefield Park round in July, there was no morning warm-up here at Sydney Motorsport Park, leaving drivers with no opportunity to run on the circuit, in wet conditions, prior to the race start. A big downpour just before the race was due to commence ensured that there’d be no dry running whatsoever, and we were set for a survival of the fittest, in the most challenging conditions of the season. Just prior to the start, the #166 CXC Global Racing entry of Jacob Andrews and Dylan Thomas was forced to withdraw. Dylan Thomas stated that they got the car going, but another problem occured, and the decision was made to sit this one out. Given how wet the circuit was, officials decided to start the race behind the Safety Car. After two laps, the Safety car headed for pit-lane, and Jacques Oosthuizen was left to lead the field away, and he did just that, by putting the foot to the floor very early in the piece, and leaving daylight between himself and the chasing pack. It didn’t take long for the field to spread out, but even when they did, there was no shortage of action, as each driver tested his or her ability, pushing their car to the limit in diabolical conditions. Brock 05 was one corner which caught several drivers out – some on more than one occasion. The most notable incident in the opening stages of the race came on lap 5, when Chris Reeves lost control of his Toyota 86 on the exit of turn 5, and hit the inside wall. It was a race defining moment for the championship contender – he sat there for some time, before resuming, and in the process, he fell back to 32nd position. From there, it was an uphill challenge for Reeves, who was in a losing battle for his third consecutive championship. Lapped traffic started to play its part, but the race continued on without a further safety car intervention, and reached the compulsory pit-stop window. Races can so often be won and lost in the pit-lane, and on a day where not much overtaking took place, due to the field being so spread out, the pit-stop was even more important. Race Leader Jacques Oosthuizen dived for the lane on Lap 13 to hand over to brother Daniel, and it wouldn’t be until later in the hour that we’d see if their stop was fast, or slow, compared to those around them. It turned out to be a slow stop for the CXC team, as they lost the effective race lead to Holt and Muggleton. The #65 team pitted, from 5th position, on lap 12, and before long they were race favourites, with an electrifying pit-stop getting them out well ahead of the Oosthuizen entry. Daniel Oosthuizen took over from his brother, and immediately set about closing the gap to Muggleton, and while it wouldn’t be an easy task, he did have the better car for the conditions, and with that, came a bit of extra lap speed. Luke Searle was the last of the Class A1 cars to pit. He would hand over to Barry Graham, and as that was happening, both Gerry Murphy and Brett headed into complete their pit-stop. Heeley was the beneficiary in that battle, as Murphy lost positions upon his return to the track. At the front, the run to the chequered flag was intense – Oosthuizen continued to chase down Muggleton, and was doing so by 2-3 seconds per lap, and it wasn’t until lap 25 that he would be in a position to make his move. Oosthuizen wasted no time in getting by Muggleton – up on the inside at turn six – and, from there, he didn’t look back, cruising away to a nine-second victory from Muggleton and Matthew Holt, who, with that finish, secured another NSW Production Touring Car Championship. Jim Pollicina and Michael Caine came home in third position – over a minute behind Muggleton. Scott Bargwanna and Michael Craig rounded out the top five, and we have to go outside the top ten to find the first non-Class A finisher, and that was the B2 BMW of Anthony Soole and Adam Burgess. Graham and Searle did enough to get sixth position, ahead of Nigel Williams, Brett Heeley, Thorpe and Herben, and Virag and Millet, who rounded out the top ten. Gerry Murphy, in his return to the series, finished 12th, just ahead of the Steve Hodges and Robert Coulthard entry. The great thing about wet weather racing, is that it brings the cars with less horsepower back into the equation, and that was the case in this race, as the Class E Nissan Pulsar of Geoff Fear and Graeme Cox came home in 14th position outright. First Class C entry was Blake Aubin in 17th position. Aubin did everything he could in his quest for the title, but second in your first full season, is not something to be disappointed about. Jimmy Vernon secured his fourth consecutive round victory in Class D, by coming home in 20th position, while the defending two-time champion, Chris Reeves, secured the Class Championship, but missed out on the outright hat-trick, coming home in 26th position (4th in Class). The O’Donnell BMW was first home in Class B1, down in 27th position, with James Herrington claiming Class S in 30th outright. Sadly, on the second last lap, Aaron and Finley Hills’ race came to an end with a mechanical drama – a sad way for father and son to end their first big race together. Post-Race, 5-second penalties were handed to the entries of Pollicina/Caine, Tate/Kiss and the O’Donnell’s (Peter and James) for exceeding track limits, while Kelly Simpson received a 5-minute penalty for failing to complete her compulsory pit-stop during the designated window. She didn’t pit until well after the 40-minute mark of the race. Fastest lap of the race was set by Daniel Oosthuizen, while he was in pursuit of Josh Muggleton, with a 1:57.5030, and the Muggleton/Holt entry was the only other car to post a time under the 2-minute mark, and interestingly, 21 cars set their fastest lap of the race after lap 20. Just the one Safety Car period, and that was to get the race underway. Sensational driving from all involved to see the race run without interruption once the green flag was waved, and in total, 28 laps (109.340 were completed by our winners, and four cars finished on the lead lap. So, another State Championship has been run and won – Matthew Holt victorious in a title fight that went down to the very last race of the season, and held our attention from first until last. Chris Reeves, gallant in defeat, but still victorious in Class D, and on the outright podium in third place as well. a terrific champion, whose reign of dominance is at an end, but Class D, and the Toyota 86 more to the point, will be massive threats to Matthew Holt’s title defence in 2017, through not only Chris Reeves, but also Jimmy Vernon – a star in the making, who won all four rounds he competed in this season. What might’ve been had he been on the grid for the opening round in May. Blake Aubin – second outright in his debut season. A tremendous effort from a young Bathurst driver relatively new to this racing game, and he will also be a driver to keep an eye on going forward. An impressive performance from Anthony Soole – the class win today with Adam Burgess gave him the Class B2 Championship. Further afield, Zac Raddatz won Class E in 2016 – the young man has proven his talent, and showed maturity beyond his years across the season, and especially in this race – finishing in 18th outright, ahead of, most notably, Jimmy Vernon and Chris Reeves. Raddatz has transitioned so very well from karting to tin-top racing, and we’ll continue to watch his development in the Production Touring Car Championship next season. James Herrington got the better of Jonathan Fishburn in Class S during the 2016 season, and it was the lack of reliability that cost Fishburn in the long run, with the engine failure during Practice for Round 3 in Goulburn, as well as further mechanical issues at SMP. Both Class S drivers have stated their desire and intention to have a new drive in 2017 – they’ll still be in one of the General’s cars, but not in their current Saloon Cars, so we expect them to appear in a different class in the 2017 Championship, which means new opponents and fresh challenges for the two men. We didn’t see Clay Skinner at every round, but when he was on-track, he impressed, and made people sit up and take notice, with some scintillating driving that saw the Class B1 competitor challenging the Class A1 Mitsubishi’s from CXC Global Racing, on a regular basis. Skinner, despite missing three of the five state rounds, did enough to beat Paul Loiacono to Class B1 honours for 2016, and he’ll be a driver to watch in 2017, with the team hoping to be on the grid for the full compliment of races. The championship belongs to Holt, but the day belongs to Oosthuizen Motorsport – they finally got the monkey off the back, and won a MoComm Cup race, putting Daniel Oosthuizen in the box seat to secure the Club Championship at Winton in December. Winton is the next stop, and we get there, the Club Championship and MoComm Cup will be decided for 2016, with two one-hour races. For now though, these drivers have a well-earned ten-week break ahead of them, on the back of a very busy five rounds inside four months, that have broken the record books, and seen the Production Touring brand establish itself as the best series going in New South Wales.